We haven't had a chance to see any Audi Exclusive made cars yet, so this was a pleasant find. 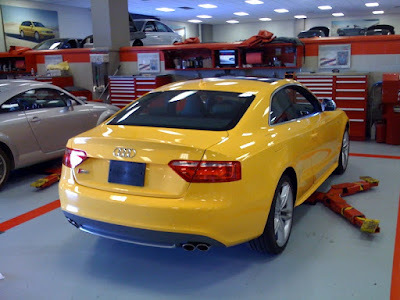 Audi North Scottsdale just received this Imola Yellow S5 and were kind enough to send a couple photos to Fourtitude. Though "arrest me yellow" may not be my choice, it sure does look nice. For those of you who don't know, the Audi Exclusive program allows Audi buyers to personalize their new car in any exclusive color combination they choose. For more information about the Audi Exclusive program, head over to Audi's exclusive website.